Despite the obstacles Jorge Mendez Barcelo faced as an immigrant from Mexico, who arrived in the United States in 2007 at the age of 15, he was able to earn his master’s degree in business administration and establish his own business. 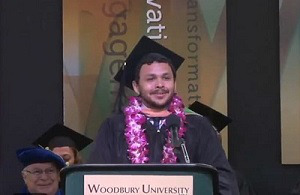 Woodbury University graduate Jorge Mendez Barcelo speaks at the commencement. After a family crisis forced him to leave behind his hometown of Villa Juarez, Mendez and a sister traveled to Panorama City, California in order to pursue life in the United States. With no knowledge of English upon his arrival, Mendez was able to learn in just six months by taking ESL classes, attending Saturday classes and adult school. Since Mendez was an undocumented immigrant at the time of his arrival, he did not qualify for financial aid. Thus, he started running cross country and track in high school in order to try to earn a scholarship from a university. After graduation, Mendez attended a local community college for three years. “I had good grades and was actually good at running, but because I couldn’t apply for financial aid, a lot of coaches didn’t offer me anything because it would be expensive for them to actually acquire me,” said Mendez. When Mendez had almost given up on his dream of a scholarship, he received a call from Hawaii Pacific University, where he was offered a full-ride athletic scholarship. There, he earned a degree in accounting. Once he graduated from Hawaii, Mendez wanted to further pursue his education. He chose to attend Woodbury University for an MBA because of its small size, which he hoped would provide him with more networking opportunities. While he was in school, Mendez entered a competition for his business class, where he presented his idea for B&O Business and Tax Consultants Inc. Currently, Mendez works for Robert Half while his business remains his side project. However, he hopes to eventually work full-time on his business. Despite the fact that it is legal for Mendez to work under his permit, he continues to face the current challenges from President Donald Trump’s administration. Under the Deferred Action for Childhood Arrivals (DACA) policy, Mendez received a work permit in 2013 but is not permitted to leave the country. Thus, he sees his family only once a year for a short period of time when they visit him in the U.S. When Mendez was asked to be Woodbury’s commencement speaker at his graduation this past year, it almost brought him to tears because his family would be able to experience all of his accomplishments with him. Dr. Satinder Dhiman, who taught and advised Mendez at Woodbury, encouraged him to apply to give a graduation speech. Within the next year, Mendez hopes to attend law school in the Los Angeles area.